Lalbiakzangi runs her tea-stall in Mizoram. 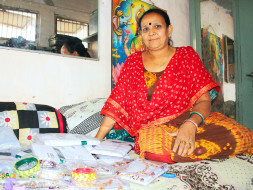 Madhuben sells cloth in Gujarat. Kavitha from Tamil Nadu rears goats. Rekha, a former Devadasi, from Karnataka, is content that her daughter is going to school and will never be a Devadasi; she also earns her living by rearing goats for milk and meat. Having little or no education, and hailing from socio-economically backward families, these women are all successful entrepreneurs. The common thread in their story is Milaap lenders like you, who gave them small affordable enterprise loans to start and grow their microenterprises. The small businesses they run allow these women to pay the fees for their children’s schools, improve their living conditions, and stay financially afloat and independent. Mothers across rural India strive hard to supplement their family incomes and ensure that their children have food, clothing, shelter, and an education. Setting up their own enterprises makes them financially more productive than, say, toiling as construction laborers. Hardworking and astute, they often grow their businesses to a point where they generate jobs for women in their local communities. Partnering with non-profits like BJS and Sreejan in West Bengal, Mahashakti Foundation in Odisha, WSDS in Manipur and Mizoram, Prayas in Gujarat, and GMF in Tamil Nadu, Milaap connects people like you to these mothers. Your small enterprise loans help them fulfill their potential and realize their goals.